Get in touch with our team at SyntecOptics.com for comprehensive design for manufacturability analysis. We use our manufacturing expertise to offer optimum solutions to our customers. Wordingham Technologies offers comprehensive manufacturing design and product support from initial consultation to production. We are experts in providing premium cost reduction analysis. We use our precision manufacturing expertise to assist customers in providing the most streamlined, cost effective machining solutions and innovative ways to improve manufacturability of every component. Because of our forward thinking and machining techniques for consistently manufacturing quality components we are always looking for ways to reduce manufacturing costs. 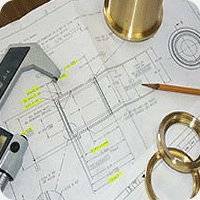 Suggestions as simple as a recommendation for increasing a simple corner radius to suggesting multiple part consolidation or vice versa making a single part in to multiple parts and CAD Design assistance can significantly reduce the cost of a part. Tony Phillips, lead process engineer, possesses 30 year of experience in turning and milling of custom mechanical components for the optics and photonics world. As a process engineer, Tony ensures design feasibility, works with our client engineers at the design phase to resolve possible production issues and suggests innovative techniques that will save cost or improve fit. Tony also works with our cell leaders on the development of critical manufacturing programming and tool selection.